It's Caramel Fada Lapsi, may lead you to pure enjoyment! 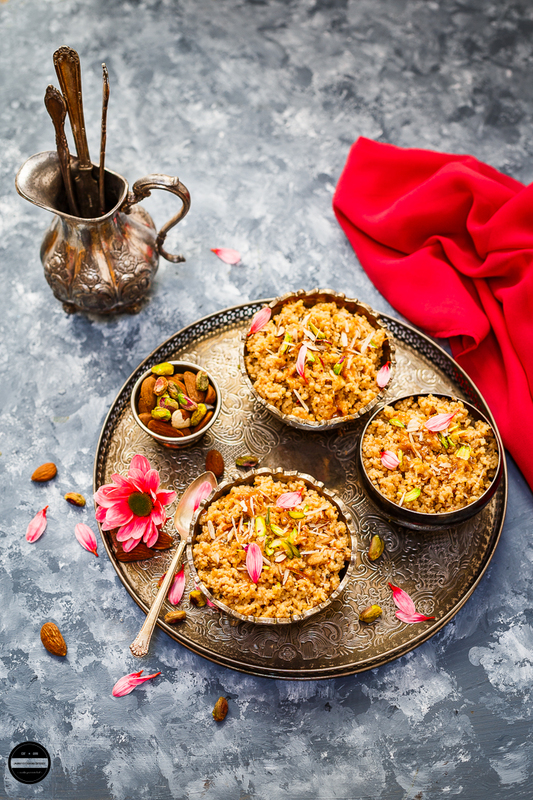 A dessert prepared with broken wheat or cracked wheat, ghee, and caramel which all makes this dessert utterly delicious, so easy to prepare and get on the table in no time flat, do I need to say more! 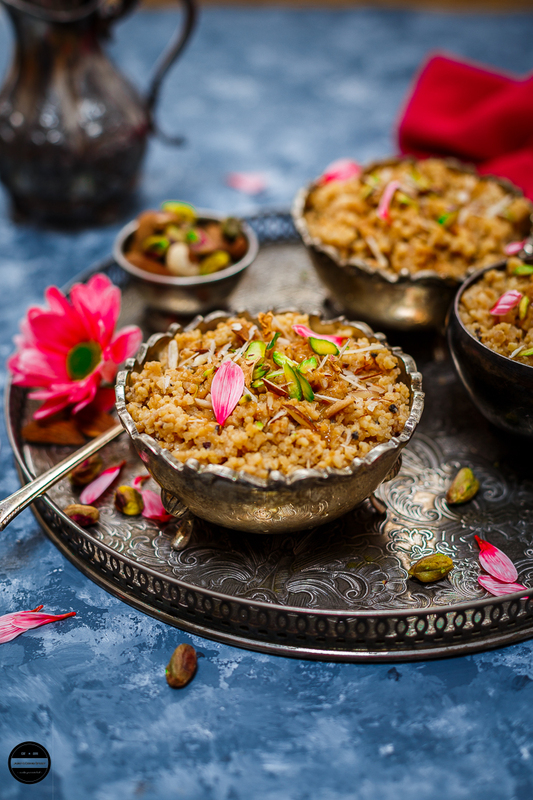 A western makeover was given to our authentic and humble Gujarati sweet dish Fada Lapsi or Fada ni Lapsi with caramel instead of jaggery or sugar. 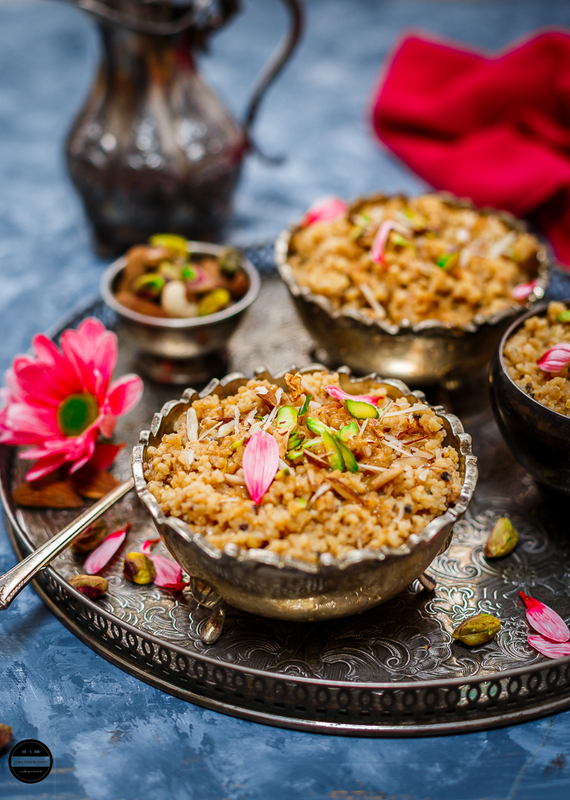 A perfect dessert to enjoy with a traditional and spicy Indian meal. Although on the occasion of Diwali, I prepare copious sweet and savoury dishes for the celebrations but never fail to prepare Lapsi, on a new years day for annakut ( offering the food to god) maybe a small amount, that's the tradition I love to follow. Being a foodie and a food blogger, experimenting with food comes naturally to me, lol many times I get wild ideas in the middle of the night and start conjuring up recipes in my mind. That is how the idea came about for Caramel Fada Lapsi. Oh yes, definitely caramel is my secret pleasure, as soon as I open up the tin I waste no time in dipping my finger. Pink flower petals are added here for the photography purpose. In some countries, caramel is known as dulce de la leche. 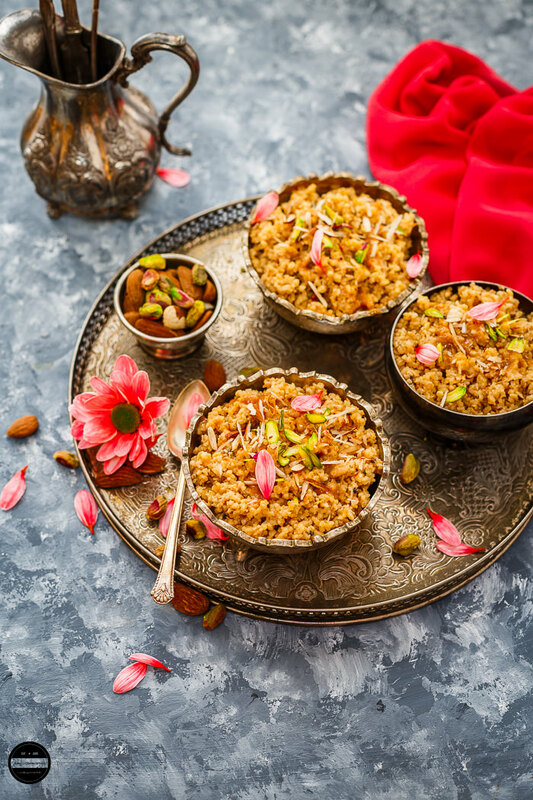 Caramel fada lapsi is a delicious dessert which is prepared with Broken wheat, Ghee and Caramel. Heat ghee in a pressure cooker and add cashew nuts and raisins. Fry for a few seconds and add broken wheat.Roast the broken wheat for few minutes or until light brown.Add hot water and close the pressure cooker lid. After 3 whistles let the pressure cooker cool down naturally. Open the lead and add the caramel (reserve a couple of spoon for garnishing)..let it cook till for a couple of minutes.Add cardamom and nutmeg powder and mix well, turn off the heat.Serve hot in a serving bowl, garnish the lapsi with remaining caramel and nuts slivers. Enjoy! Loved the recipe.. wanna try soon. Beautiful photography.. Thanks Ruchi. Hope you try it one day. Looks yummy and love the variation in the Lapsi making. Do you find broken wheat quite chewy ? It just looks divine. Even I never fail to dip my finger in caramel. It's just so satisfying. Replacing jaggery with caramel should be interesting. Lol..we should make Brown Gang :P just like Gulabi gang! just kidding. This is a sheer torture, yo have to parcel me some of this addictive lapsi. Love love your pictures and the gorgeous props too. I agree this can be addictive. Cant stop drooling.. Definitely in my to do list !! I am totally in love with this recipe! Learning such new recipes with you! Beautiful Photography Jagruti, beautiful background used, this lapsi is a new recipe to me, bookmarking it to try later. This recipe certainly sounds very innovative and I am sure tasted delectable. Did you use the caramel condensed milk??? Also I love your props they are beautiful. Thanks Nayna! Yes I used caramel condensed milk, Nestle brand. Can it be made using homemade caramel sauce... Or v need dulce de leche for it... ? Yes, you can hommemade caramel sauce as long as your homemade sauce has cream in it. Only with sugar made caramel might taste little bitter. Wah wah Jagruti... you seize to amaze me.... what a twist to the normal lapsi. Lovely twist to the Lapsi Jagruti. Looks so yumm. thats amazing broken wheat sweet. never imagined broken wheat can look so tempting and delicious. Will try.Clciks are very beautiful. Wow jagruit love the pics!! The light is amazing !! Such a lovely recipe and a quick one too! We have such gem recipes in our cuisine, that can be made in a wink!! Love the addition of caramel! Thanks for linking our broken wheat recipes too!! We Sindhis also make lapsi .. I love the one with jaggery. Delicious sweet and the lovely clicks gives a festive mood ! Loved it !